Here we are going to discuss the interrelation of YouTube Recommendation Algorithm and Millennials. In the present era, 90% of the millennials are being addicted to the digital media usage through user-friendly gadgets. In that, the YouTube is the most seeking video platform for the teenagers to find anything that is not available on any other platform. They might choose it for either entertainment or education or anything else. Youngsters have more patience and anxiety to know more about something interesting. The teens at this will be easily hooked with the daily routine to continue. The YouTube recommendation algorithm can be considered as the major stream to addict the Millennials by spending hours of time on YouTube. How is the YouTube Recommendation Algorithm showing an impact on Millennials? This has completely become Hawk-eye in updating the audience preferred video content. Is there anything strange in this deliberation? The aim of this algorithm is to present the high-quality video content that penetrates each teen towards the content. The recommendation of other videos on YouTube is the critical task that should consider three points that exactly reach the audience especially millennials. Balancing such a huge database is highly difficult through this algorithm and feeding at bulk should be done at efficient way. Most of other recommendation algorithms are being well at a small scale but drop down in solving major issues. But YouTube Recommendation Algorithm had overcome all those. This system should be hyperactive to update the newly arrived video content and activities done by the creator. This could be done at the collection of vigorous video content just in second. The YouTube recommendation algorithm is associated with the concept of neural networks. The algorithm will consider the neural networks by focusing on two categories i.e. generating candidates and raising the rank. In this the user network will find the history of the user through the video IDs, demographics and search results. The ranking network will rank the videos depending on its demand at the audience associated with the features which describe the audience and the video. Now the highly scored videos will be dispatched at the audience in which the recommendation of million videos will participate. Here the A/B testing will be conducted to find the efficiency of that recommendation algorithm. The neural networks are nothing but the process of using a set of algorithms to know the under laying connections which are more flexible to use the updated input and generates the best output. Here the comments that have been provided by the user at a particular video will be detected by the deep neural network that implies to make recommendations for the audience. Based on the rank of each video scored will be recommended by considering the watch time, view count, shares and comments. The one more thing is the videos on YouTube which are alike will be deleted from the list of recommendation at the audience, instead of that the heterogeneous video content will be displayed. Here the deep neural network algorithm works to allocate the rank for each individual video with help of logistic regression and then the collected list will be presented to the user where the A/B testing is implemented. A fresh and varied video content will be most preferred by the user. The other important feature of video ID score will be measured in the recommendation algorithm including the search query and the devices that have been used by the audience. The predicted watch time will be analyzed it may be positive or negative. The method of “logistic regression” is used to forecast the watch time. Depending on the watch time the positive clicks will be counted and the specific weight will be added to the unclicked videos. When the procedures have been applied to measure the predicted watch time by picking the clicked and unclicked videos then some data will be veiled. That is if the negative clicks watch time gain higher score than the positive clicks watch time then it would be considered as the failed anticipation of watch time. This algorithm will take measures to overcome this issue and recommends the best category. 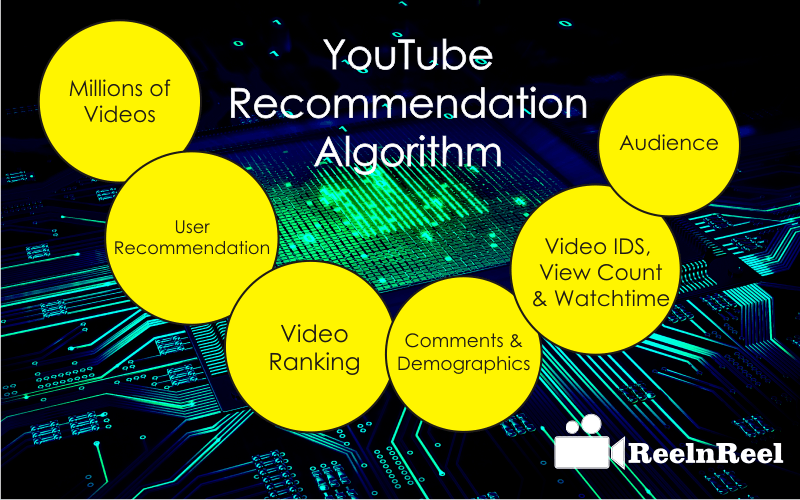 By sketching the overview of all the points mentioned above the YouTube recommendation algorithm will push the video content at the audience. Such advanced techniques that have been implemented by the YouTube recommendation algorithm will deliver the Millennials most seeking video content, and this will make them to addict with YouTube.